If you need a few executive chairs for the office, purchase executive fabric chairs. There are many advantages that come with using executive fabric chairs and Mark Downs Office Furniture is here to help you learn all about them. As reported by the Office Of National Statistics, more than 70 percent of employees in the office suffer from back pain at some point in their working lives. The most common reason for back pains suffered in the office are from poor quality chairs. By using a poor quality chair at work, one can suffer from long-term bad posture, headaches and spine and pelvis problems. The types of chairs for workers are the ones that allow them to sit in a position that naturally balances and well supports the spine. Also, thighs should be angled in a slightly downwards direction to encourage good blood flow to the lower body. 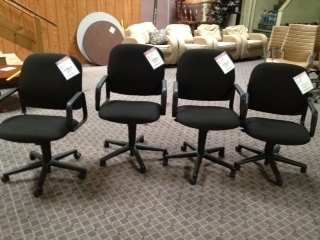 Ergonomically made executive fabric chairs can be purchased at an affordable price at Mark Downs Office Furniture. We guarantee for your office works enough special padding for them to comfortable sit for extended periods of time. The executive fabric chairs are practical, well designed and made to match the aesthetic of nearly any office. This entry was posted on Friday, September 28th, 2012 at 8:24 pm. Both comments and pings are currently closed.